But I have finally made it to the gyros bandwagon this time round. Delayed, yes. It could have been longer, but it was a shame my brother did not get enough votes to back him up on our lovely lunch visit. 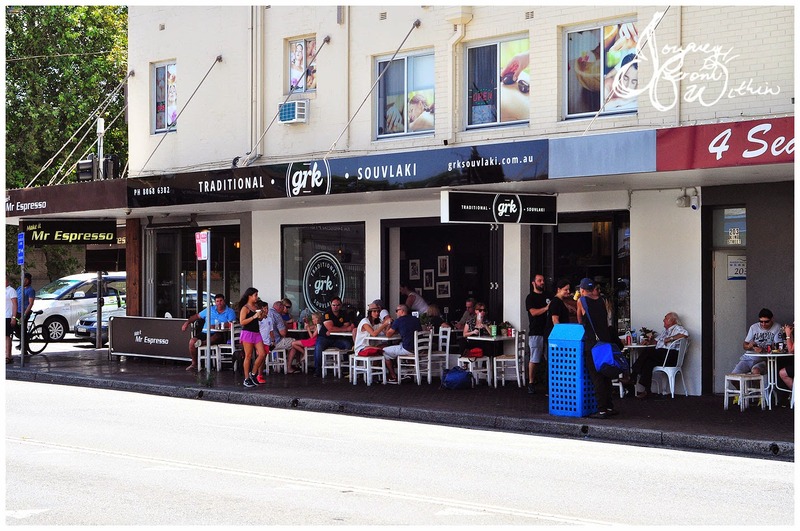 My brother seems to be more of a foodie than I, as he has pretty much tried all the gyros’ around and said, “You have one, you’ve pretty much had them all.” So, we went to the closest one to us, grk in Mascot. 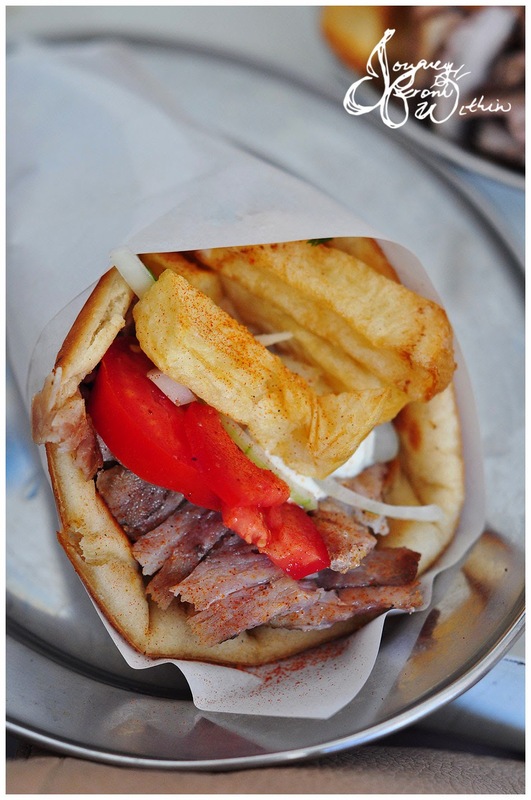 I’ve always imagined gryos to be a Greek version of the Lebanese kebab. Although I have learnt that anything smaller than a Lebanese kebab is known as a ‘spring roll’ to my brother. I ordered the pork gyro, because I am a porkie pig lover. The pita bread is toasted, giving the exterior a little crusty feel, the inside was soft and a little chewy, mmm~ The pork was nice and tender, with soft spice flakes. 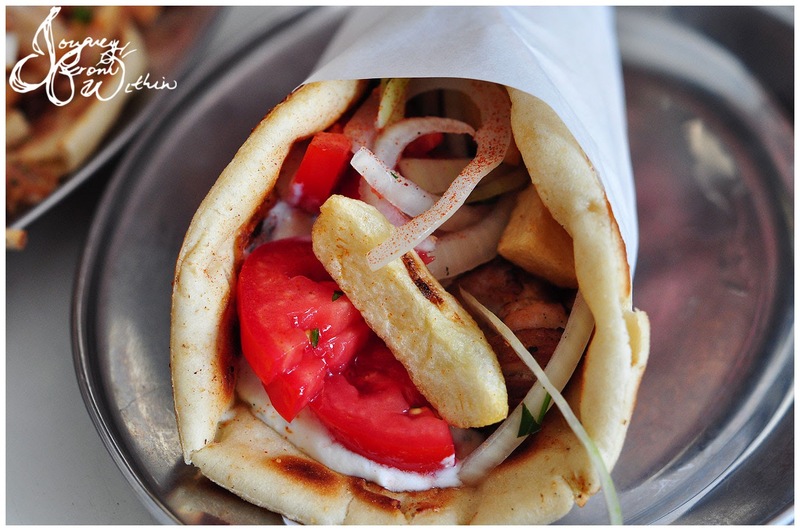 Miss DT ordered a chicken souvlaki, we were thinking it would have out as skewers but it was a gyro. However, I’m sure she enjoyed it none the less. Because if you’re going to go out on having chips, don’t stop halfway – go all the way with feta! Fat chunky, hand cut potato chips had us digging in from all angles, trying to get a touch of feta with each chip we demolish. As I mentioned, my brother called gyros (at any shop that he has been to) spring rolls, so I noticed the meat platter and suggested he order that. Taking his word for spring roll, Miss DT and I had every intention to share his platter with him – but obviously could not. 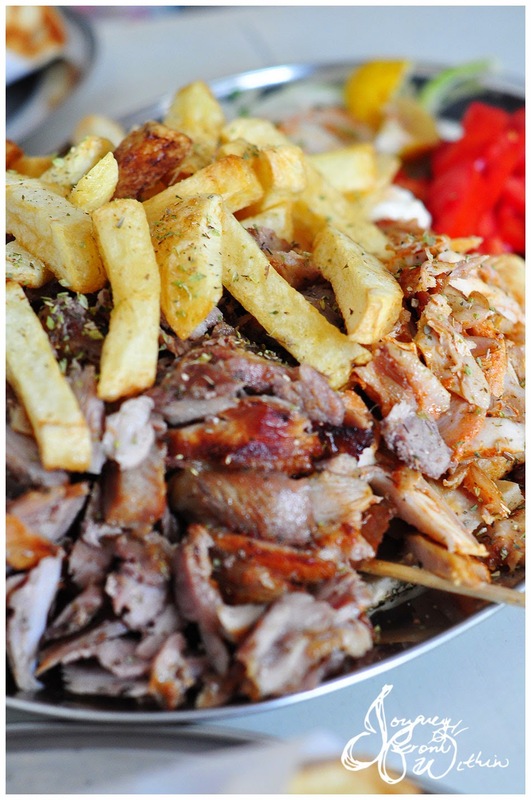 A mix of chicken, pork, chips, salad, and souvlaki’s came out on a platter. Underneath it all were pita breads too, this was no spring roll… But mission accomplished, my brother was well fed and had some left over for his next meal too. 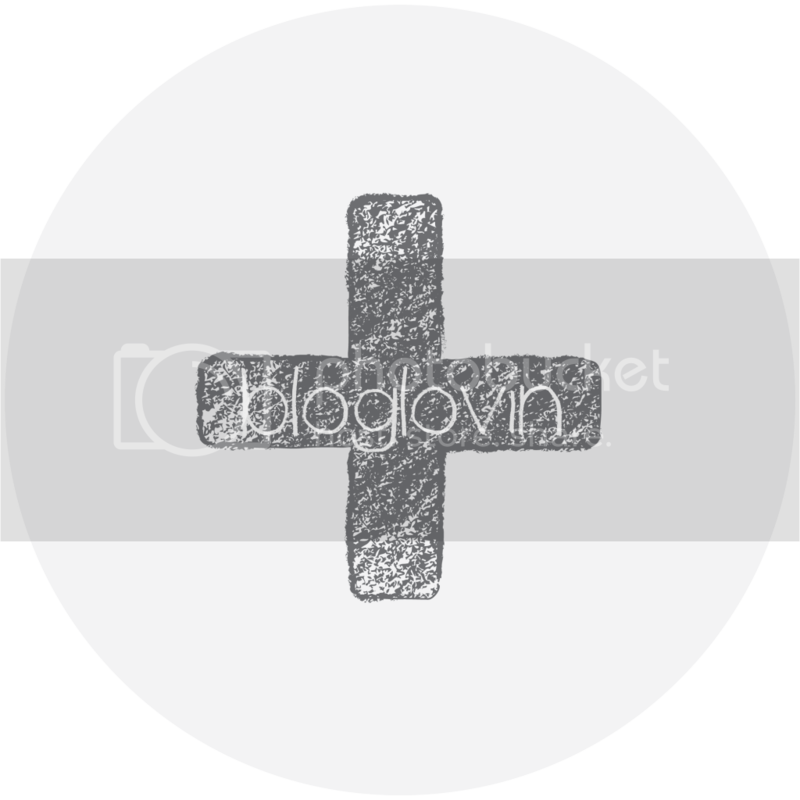 Do you have name a certain food after another to illustrate to people the size of the food? My bro loves to use spring rolls! haha! There's something about the combination of any type of bread with pork, chicken or beef that makes me incredibly happy! Nice to see they were generous with the fetta. 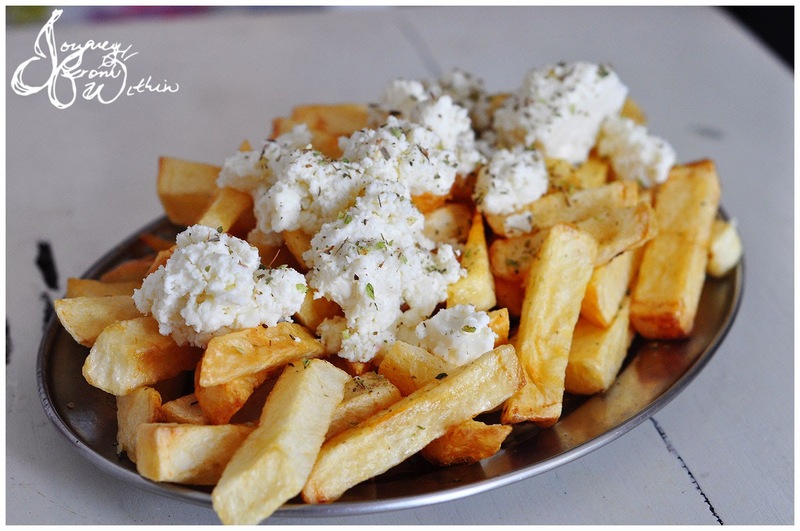 Chips with feta looks good!